Will Siyabonga ‘Bhele’ Nomvete aid Pitso’s catastrophic team? Bafana Bafana coach Pitso Mosimane named his solders for the 2014 world cup qualifiers games where the local team will play Botswana and Ethiopia. His selections include the Moroka Swallows’ forward veteran Siyabonga “Bhele” Nomvete, he is the man whom the whole nation has recommending to join the national team. 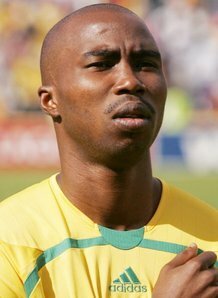 Bhele is a leading goal scorer in the Premier Soccer league. Nomvete has proven himself that he still can deliver as he runs like a horse on the pitch. The young players have a lot to learn from Bhele including Mosimane’s favorite striker, Katlego Mphela. The inclusion of Orlando Pirates striker Tokelo Ratnjie has been applauded by the fans in the social networks. It seems like Mosimane is slowly getting it, his selection is not bad at all. He needs to get the team ready for the game against Ethiopia on June 3rd before travelling to Botswana on June 9th. The squad needs to make up for their catastrophe to qualify in Carbon and Equatorial Guinea for the Africa cup of nations. The success of this team will depend on the tactics of Mosimane and his technical team. All eyes are on them since they have an additional assistant coach, Steve Komphela. Mosimane is expected to be consistent when selecting players for the national duty to ensure that players understand each other well in the field of play. They need to build a winning mishmash and go all out. South African Football Association (SAFA) should organise more friendly matches with the most respected teams in Africa to ensure that Bafana are also at cutthroat level. This will give Mosimane an opportunity to develop the pathetic departments. It was also a wise move for Mosimane to invite Santos striker Eleazar Rodgers to the camp though he asked to be excused due to relegation playoffs which started on the 23rd May till June 23rd. Rogers is among most youthful promising strikers. Lehlohonolo Majoro has been called to replace him which is still not a bad idea at all; hopefully he will not be fighting with News Café, Melville security guards. Orlando Pirates goalkeeper Moneeb Josephs who was also part of the selected squad has confirmed that he is no longer vacant for the national sense of duty. His teammate Benni McCarthy was quoted in the media saying that Josephs is frustrated for being the second choice goalkeeper. This should not be regarded as a retard; instead it should be seen as an opportunity for young goalkeepers. The nation should support the available and willing players to serve in the national team. Gone are those days where would dwell on one particular player as we did few years back with Benni McCarthy who once decided to withdrew from playing for Bafana. We need to strive for results with patriotic players and close the eyes to individuals like Josephs. The entire nation should once again rally behind the national team with their flags high despite all the team previous malfunctions and give the boys another chance, perhaps this time they will get it right.